sorry for the language. Does it mean closed down or renovation? Thank you very much.. Wondering what's happening? Anybody know? I was so worried I called them this morning.. I'm glad they're still there. Guess they got lots of call today regarding the post. Terry & Fiona receive many calls due to this posts!! 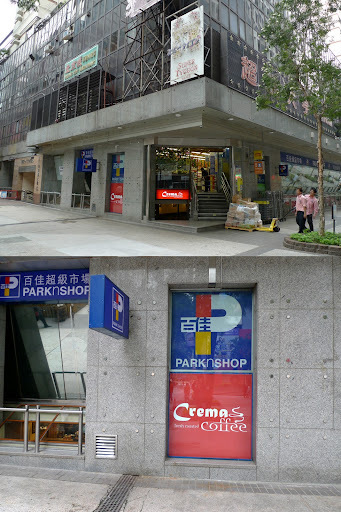 發表於: 星期六 十二月 04, 2010 8:07 pm 文章主題: Crema Coffee this morning! Crema Coffee this morning, December 4, 2010! 發表於: 星期日 十二月 05, 2010 8:48 pm 文章主題: Got you! Crema Coffee today! Haha. Got you.! So, I tried to pull an Alex thing but can only get very little. This means our coffee community is very up-to-date... A great thing, indeed. 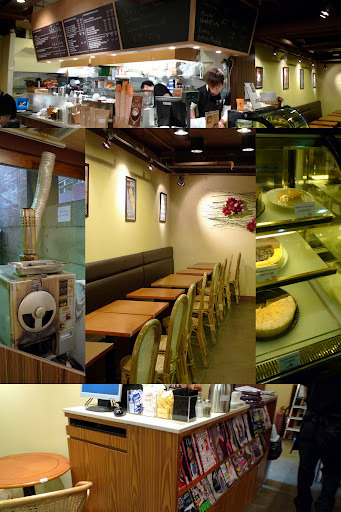 This morning (Sat Dec 4, 10), I suddenly craved for Crema Coffee, my favorite café in Hong Kong though I haven’t visited this place for a while. Slumbering but very hungry with no breakfast at almost lunch time, I made my way to Tsim Sha Tsui East and stood there flabbergasted with the sight in front of me. My fear finally came true! 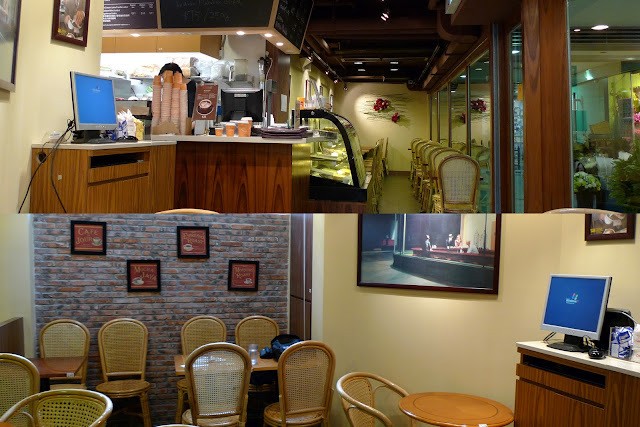 Early August this year, Alex (seiyapicasso) a coffee lover on this webboard posted on the coffee enthusiast webboard, saying that Crema finally closed down for good. I was panicked at the time and made a call to the shop next morning and was glad to find out the shop is still in business. I visited Crema next weekend to make sure it was still there. 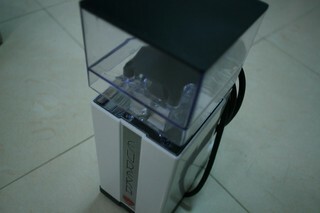 Apart from Crema receiving phone calls about the issue, things were good. But now it’s the real thing in front of me! Walking closing I was happy I found a map to a new shop. Crema didn’t close down, just moving.. OMG! The map, however, does not help; I almost walked back from Tsim Sha Tsui East to Tsim Sha Tsui. Low in sugar, confusing and in need of coffee, I finally gave up on the map and called the shop. Man needing coffee finally found his Shangrila!!! The roaster on the left hand side was not to be missed! Ditto the familiar face of Terry working behind the counter. Everything looked more airy than the old shop though all the things including cake showcase, table/share and nice pictures on the wall joined the new shop here too. Wait no more, I ordered my usual Capp and Croissant. To me, Crema has the most luxurious milk drink in Hong Kong with velvety, rich, thick milk texture at the right temperature (need to tell Terry you want it warm) but a bit short of sweetness. 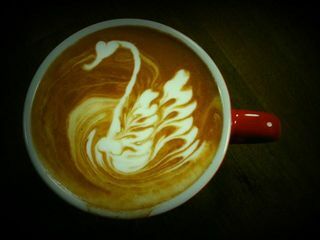 The familiar chocolaty tone was still there in the capp. Croissant is as flaky and good as it was so all my familiar things that made me fall in love with this café were still there. This is a perfect pairing I suggest one tries it here. My ristretto shot was meticulously prepared with test shots and the resulting cup was familiar and good. One good thing seemed to be the roast which was lighter though a bit less heavy hand with the coffee bean should give the bean back all the glory I had on the very first year I dropped by this place. This time, I can sense a nice acidity which resembled grapefruit but not as bitter. A nice mouthfeel toward the end helped parting the cup difficult for me. 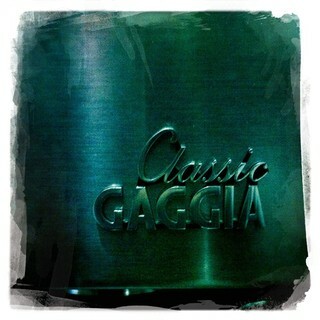 So, I proceeded to order espresso here for the first time to see how its ‘standard’ drink was like. The cup was much more subdue and less tasty overall than its ristretto. Nevertheless, the layers of taste in espresso was much clearer with a somewhat ashy first few sips, following by a clearer grapefruit like acidity and ending with a syrupy consistency. It’s quite nice and not acrid; the crema did not look that blond to me. 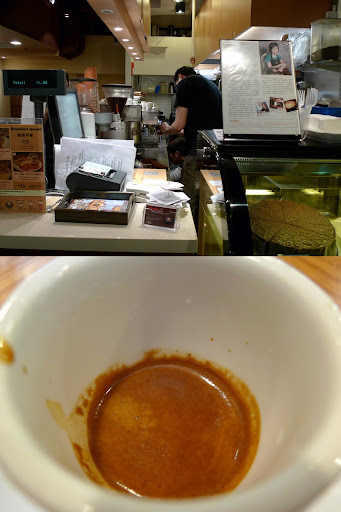 However, previous ristrettos I had at Crema also exhibited this kind of layers/tasting note and was tastier so I prefer/recommend ristretto at Crema. Mind you that the waiter/waitress may not know ristretto so ordering this drink when Terry or Fiona is around. My seat under the skylight. Looking back, you see Terry working behind the paper cup. Come to think about it, the coffee at Crema that I haven't been enjoyed all these years reminded me of Silly Monster blends at 18 Grams, ie the stabilized Silly Monster should tasted quite similar to Malabar Monsooned blend served since Crema opened its door in 2005, IIRC. Anyway, just my 2 cents.